Today, at 1:00 PM the Green Bay Police Department, the Divine Temple Church, and the Boys n Girls Club (1451 University Ave, Green Bay) are hosting the Spring Break “Bring your own 5” (BY05) basketball games for kids enjoying their spring break from school. The tournament’s mission is to provide a safe and fun environment for all young people, while instilling in them core values such as; good sportsmanship, team building, and leadership. 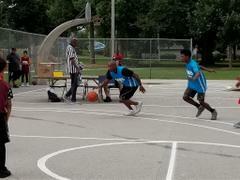 In addition, the tournament brings police officers and youth together to form relationships that will last a life time. “We want to provide a place for kids to come and interact and meet police officers while on Spring Break,” said Cmdr. Kevin Warych. “We want all kids to see police officers of who they are and we use basketball to make that connection,” said Warych. We encourage kids of all ages to come out and play basketball. The games will start at 1:00 PM and end around 3:30 PM. All youth are encouraged to attend and teams can be formed at the club. All kids are welcome even if they are not playing and admission is free. Food and refreshments will be available for the kids.